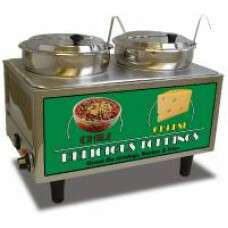 This dual well warmer is designed specifically for chili & cheese or popcorn butter (Optional Pumps available). The twin 7 quart wells are ideal for the toppings and it comes complete with the hinged inset lids and two long-handled, 3 ounce, one-piece ladles. It is constructed out of 18/8 stainless steel and comes with Benchmark USA's three-year warranty for worry-free operation. The extra long legs provide easy access for cleaning and the eye-catching graphics will promote sales. Whether you serve chili-cheese dogs, nachos or chili-cheese fries or Popcorn butter you"ll appreciate that the pans, lids, ladles, pumps and adapter plate are all removable for easy sink or dishwasher cleaning. It has a covered master switch and an adjustable thermostat for all cooking conditions. NEW OPTIONAL 1 PUMP 1 LADLE OR 2 PUMPS We are the only AUTHORIZED CANADIAN DEALER located in CANADA in CANADIAN DOLLARS, DUTY FREE, NO CUSTOM FEES or BIG SHIPPING FEES.